Usually, after swimming in the sea with the hot sun bearing down, my eye area gets very irritated and sore. This time around, there was so such irritation and soreness. I think eye protection is essential as the skin around the eyes is so delicate but I found it very difficult to find an eye protection product with a sufficiently high SPF. Most eye creams have an SPF15 (if it has a SPF at all) which is completely inadequate outside of the UK, or even on very sunny days here. 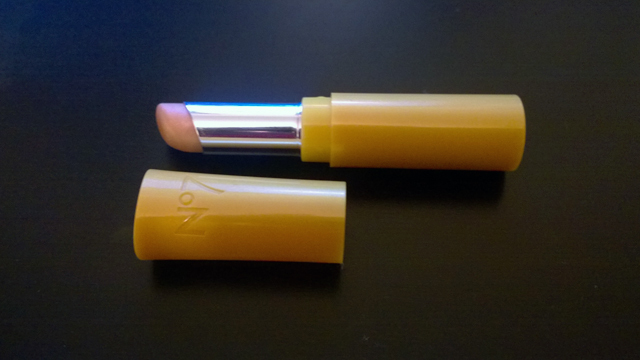 This No7 Shimmering Lip and Eye Screen is the only reasonably priced protection with a SPF of 30 that I could find. The Shimmering Lip and Eye Screen has a subtle golden shimmer which had a brightening effect on my eyes. I seldom wear make-up on holiday so this was a great bonus – it doesn’t feel like make-up but still looks pretty! I used it all over my eyelids and under my eyes. Although this can be used for the lips, I had already purchased the Soltan Moisturising Suncare Stick so I didn’t try it on my lips. The No7 Shimmering Lip and Eye Screen will now take a place in my hand luggage as a holiday essential!